رضا, منا, عباسی, محمد‌رضا, جوان دولویی, غلام, سدیدخوی, احمد. (1393). شناسایی گسل مسبب زمین لرزه 29 آذر 1389 محمدآباد ریگان (کرمان) و سازوکار کانونی آن براساس تحلیل پس لرزه ها. مجله ژئوفیزیک ایران, 8(1), 59-70. منا رضا; محمد‌رضا عباسی; غلام جوان دولویی; احمد سدیدخوی. "شناسایی گسل مسبب زمین لرزه 29 آذر 1389 محمدآباد ریگان (کرمان) و سازوکار کانونی آن براساس تحلیل پس لرزه ها". 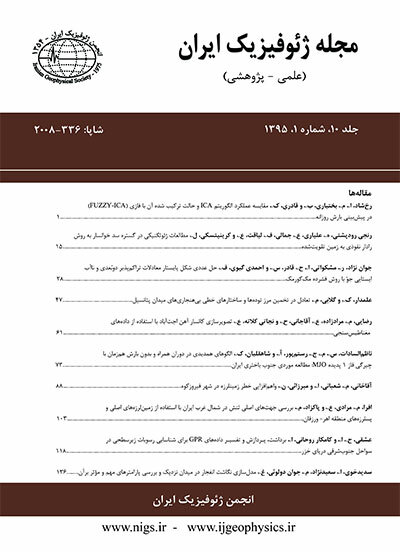 مجله ژئوفیزیک ایران, 8, 1, 1393, 59-70. رضا, منا, عباسی, محمد‌رضا, جوان دولویی, غلام, سدیدخوی, احمد. (1393). 'شناسایی گسل مسبب زمین لرزه 29 آذر 1389 محمدآباد ریگان (کرمان) و سازوکار کانونی آن براساس تحلیل پس لرزه ها', مجله ژئوفیزیک ایران, 8(1), pp. 59-70. رضا, منا, عباسی, محمد‌رضا, جوان دولویی, غلام, سدیدخوی, احمد. شناسایی گسل مسبب زمین لرزه 29 آذر 1389 محمدآباد ریگان (کرمان) و سازوکار کانونی آن براساس تحلیل پس لرزه ها. مجله ژئوفیزیک ایران, 1393; 8(1): 59-70. روند امتدادلغز راست گرد است که باعث ایجاد مناطق فروافتاده در محدوده مورد بررسی شده است . An earthquake of magnitude 6.3 (M.w) rattled south eastern Mohammad Abad Rigan at 22:11:58 local time, December 20, 2010 in the borders of Kerman and Sistan & Balouchestan Provinces. The epicenter (59.2E, 28.35 N) has been reported 52 kilometers away from the city of Mohammad Abad Rigan. Although there was no fault pointed on the geological maps in terms of the location of this earthquake, the aftershocks were recorded in two temporary seismological networks using 10 stations altogether from December 24, 2010 to January 24, 2011. In addition, the data recorded in the IIEES broadband seismic network was added to the mentioned data during the process. The goal of operating temporary seismic networks was aftershocks analysis in this area. Investigation and study of aftershocks behavior has done based on three component waveforms. This study contains three main parts. The first part is operation network, data gathering and preprocessing. In the second part, we try to locate and relocate aftershocks based on new database. The third part is fault pale solutions of aftershocks based on p-wave polarity technique. Locating over 500 aftershocks in the network, we recognized a fault with the length of 30 km, southwest-northeast strike and 32 NE trends. The most of aftershocks are located in a depth range of 2-15km; while a few earthquakes have greater depth to 23km. Investigation of the rate of aftershocks showed that the number of them decreased as time increased during three weeks. After that, the rate of aftershocks was increased for two weeks and finally another large earthquake happened in the area with magnitude of 6.3. Therefore, decomposing and distinguishing of aftershocks of first mainshock from foreshocks of the second mainshock is a great change here. In this study, we assume all events as aftershocks of first mainshock. Determining 28 focal mechanisms pertinent to the aftershocks as well as perpendicular sections on the aftershocks, we recognized the strike slip right - lateral fault, with a tensional component, dip 90 degree which met the surface. It is worth noting that according to the geological evidence and comparison with the results obtained; this region has a complex structure. Also, it comprised some right - lateral parallel strike slip faults bringing about wrinkles in the given area. Our results are in good agreement with the geological and morphotectonic evidence. The mechanism and trend of the Mohammad Abad fault can be interpreted with the previous GPS measurements in eastern part of Iran. اسلامی، آ.، اشعری، ع.، 1389‌‌، گزارش زمین‌لرزه 29 آذرماه 1389 جنوب خاوری محمدآباد ریگان: گزارش پژوهشگاه بین‌‌المللی زلزله‌شناسی و مهندسی زلزله (IIEES). اسلامی، آ.، 1389، گزارش زمین‌لرزه‌‌های 7 و 8 بهمن‌‌ماه 1389 جنوب خاوری محمدآباد ریگان‌‌: گزارش پژوهشگاه بین‌‌المللی زلزله‌شناسی و مهندسی زلزله (IIEES) . حسامی آذر، خ.‌‌، جمالی فرد، ف. و طبسی، ه.، 1382، نقشه گسل‌های فعال ایران: پژوهشگاه بین‌‌المللی زلزله‌شناسی و مهندسی زلزله. Berberian, M., and Yeats, R. S., 2001, Contribution of archaeological data to studies of earthquake history in the Iranian Plateau: Journal of Structural Geology, 23, 563-584. Gillard, D., and Wyss, M., 1995, Comparison of strain and stress tensor orientation: Application to Iran and southern California: J. Geophys. Res., 100(B 11), 22197-22213. Jackson, L., and McKenzie, D., 1984, Active tectonics of the Alpine-Himalayan belt between Western Turkey and Pakistan: Geophys. J. Astr. Soc., 77, 185-264. Havskov, J., and Ottemoller, L., 2010, Routine Data Processing in Earthquake Seismology: Springer Science +Business Media, B. V., 352 pp. Kissling, E., 1988, Geotomography with local earthquake data: Rev. of Geophys., 26, 659-698. Kobayashi, T., Mikio, T., Suzuki, A., and Noguchi, Y., 2012, InSAR-derived Co-seismic deformation of the 2010 Southeastern Iran Earthquake (M6.5) and its relationship with the tectonic background in the South of Lut Block: Bulletin of Geospatial Information Authority of Japan, 60, 1-11. McKenzie, D. P., 1972, Active tectonics of the Mediterranean region: Geophys. J. Astr. Soc., 30, 109-185. Nowroozi, A. A., 1972, Focal mechanism of earthquake in Persia, Turkey, West Pakistan and Afghanistan and plate tectonics of the Middle East: Bull. Seism. Soc. Am., 62, 832-850. Snoke, J. A., Munsey, J. W., Teague, A. G., and Bollinger, G. A., 1984, A program for focal mechanism determination by combined use of polarity and SV-P amplitude ratio data: Earthquake Notes, 55, p15. Shirokova, E. I., 1962, Stresses effective in earthquake foci in the Caucasus and adjacent district: Izv. Akad. Nauk. USSR, Ser. Geophiz., 10, 809, Tectonophysics, 4(1), 85-105. Tatar, M., Hatzfeild, D., Moradi, A .S., and Paul, A., 2005, The 2003 December 26 Bam earthquake (Iran), Mw 6.6, aftershock sequence: Geophys. J. Int., 163, 90-105. Vilcox, R. E., Harding, T. P., and Seely, D. R., 1973, Basic wrench tectonics: Bulletin of the American Association of Petroleum Geologists, 57, 74-96.